Headwater’s Bikes For Africa campaign has got off to a flying start. ‘Recycle’ is a charitable organisation that collects old and used bikes, or bits and pieces thereof, and sends them to places in Africa where they can be reconditioned, reassembled and used by the locals. Not only are Headwater sending hundreds of spare parts taken from our used bikes to the Bike For Africa depot at the end of every summer season, we are also taking on to deliver any bikes you want to get rid of yourselves. 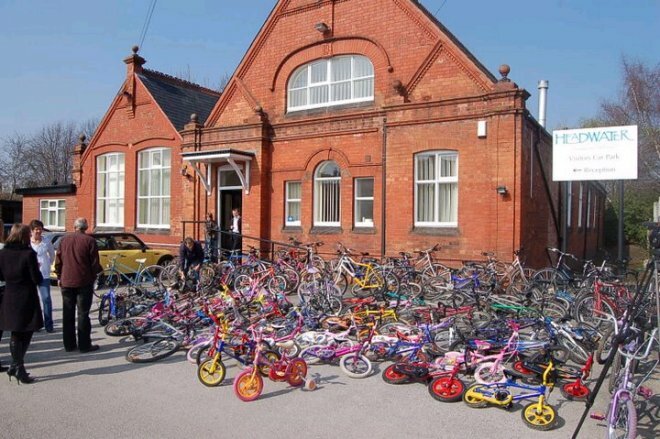 This is why we suddenly found ourselves nearly 100 bikes better off when we held a ‘bring your old bike day’ at one of our local schools, and you can see the results for yourself! All of these bikes will be broken down into spare parts and shipped off to places in Africa that can really use them. We would just like to thank everyone who participated for taking part – it was a brilliant result and we are thrilled to be able to help such a worthy cause! Everything you ever wanted to know about bikes and their various inventions over the ages has been studied and analysed by a gentleman called Jim Langley on his curious website. “We should give as we would receive, cheerfully, quickly, and without hesitation; for there is no grace in a benefit that sticks to the fingers”.